Three weeks earlier, when we were visiting Beth's relatives in Dallas, her grandparents called home to Montana and discovered that they had just had snow up in the Beartooth Pass. The very idea seemed almost surreal to me. 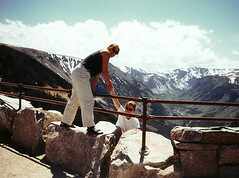 Their concern centered around Beth not being able to take me up the mountain and show me the views. As the roads become harder to plow on the Pass, they close the gates farther down the road, which effectively cuts off access to the Pass. Fortunately, by the time we drove up to Red Lodge from Billings, most of the snow had melted. But you could still look up on the mountain and see the snow. Needless to say, I had to see the road that had so much snow that it sometimes had to be closed even in the summer. We climbed the pass on a switchback road, stopping occasionally to take in the view. The road teetered quite close to some severe drop-offs, but we drove on. Around 11,000 feet, we ran into snow. July 1, the very heart of summer and the higher we drove, the deeper the snow. Amazing. The temptation was irresistible. We pulled the car over and Beth, Keely and I piled out to build a snowman. As you can see we were dressed for the warmer weather at the bottom of the mountain, but that didn't faze us.